“Computing machines can do readily, well, and rapidly many things that are difficult or impossible for men and men can do readily and well, though not rapidly, many things that are difficult or impossible for computers. This suggests that a symbiotic cooperation, if successful in integrating the positive characteristics of men and computers, would be of great value” (Licklider, 1960). In 1960, Licklider identified the problems for realization of such ‘man-computer symbiosis’ in speed mismatch between men and computer, memory hardware requirements, memory organization requirements, differences between human and computer language and input and output equipment, the latest being the most problematic. Fifty years later this still holds true. Today Human-Computer Interaction (HCI) is concerned with the above-mentioned problems i.e. 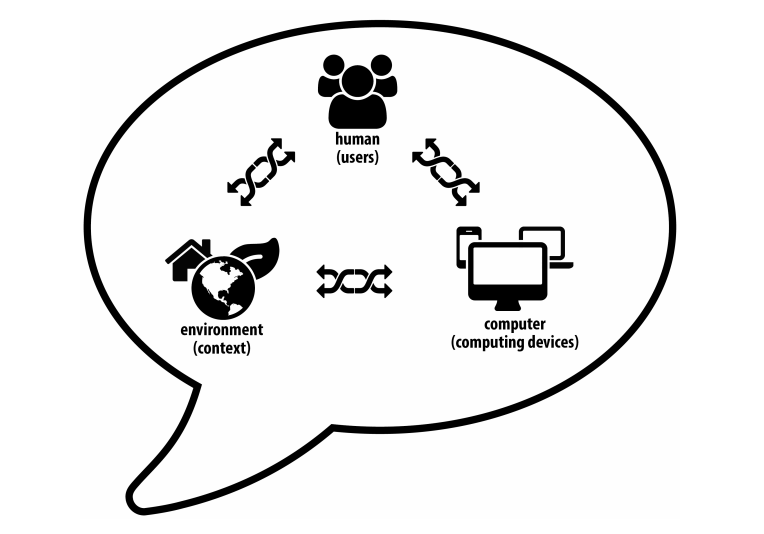 the design, evaluation and implementation of interactive computing systems for human use and the study of major phenomena surrounding them (Hewett et al., 2009). HCI is an interdisciplinary area deriving its knowledge from computer science (application design and engineering of human interfaces), psychology (the application of theories of cognitive processes and the empirical analysis of user behaviour), sociology and anthropology (interactions between technology, work, and organization), and industrial design (interactive products). Interaction between human and computers takes place at the user interface. This is why research and development of user interfaces lies at the very core of HCI. We will first briefly present the development that led to today’s user interfaces and then focus on multitouch displays, their construction and use cases. Early digital computers used batch interfaces. They consist of punch cards for programs and data input and prints as output. Batch interfaces are non-interactive, which means that the user has to specify everything prior to processing and is never prompted for additional input until the job is done. With the connection of teletype machines to computers and the advent of dedicated text-based CRT terminals in the late 50s, batch interfaces gave space to command line interfaces (CLI). CLIs brought speed and interactivity to human computer interaction. In the early 60s, Douglas Engelbart invented the first mouse prototype used for manipulating text-based hyper-links as a part of his ‘augmenting human intellect’ project (Engelbart, 1962). Later, researchers at Xerox PARC extended the concept of hyper-links to graphics and by doing so created the first graphical user interface (GUI). In respect to the CLI, GUI facilitates a more intuitive interaction because there is no need to learn commands by heart as available commands are presented on the screen in the form of windows, icons, menus and a pointer. This interaction paradigm can be emphasized by the acronym WIMP. Further efforts focused on the development of interfaces that interact with humans in a seamless way by understanding natural expressions of the user’s intent instead of forcing him/her to learn new rules for interaction. 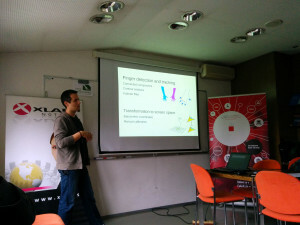 The results of these efforts are, among others, various speech and gesture recognition techniques known as Natural User Interfaces or NUIs. Multitouch displays (Han, 2005): tracking and recognizing multiple fingers (and objects) on a display, which leads to new interaction techniques. These displays differ from touchscreens capable of detecting one touch in that they allow for a different interaction paradigm, while touchscreens are just a replacement for the input device, usually the mouse, in a GUI. Speech recognition (Rosenfeld et al., 2000): interfaces based on speech recognition, speech synthesis and natural language processing. Space gesture recognition (Hay et al., 2008): 3D tracking or motion capture using Nintendo Wii or similar controllers as stereo vision systems. The user interacts with the system by performing, usually predefined, spatial gestures. Interfaces based on electrophysiological signals (e.g. Brain-Computer Interfaces, Wolpaw (2002)): these interfaces determine the intent of the user from electrophysiological signals caused by brain, muscle, and cerebral cortex activity. For example, classifying finger gestures by interpreting forearm electromyography (EMG) signals caused by muscle movements (Saponas et al., 2009). These interfaces are also known as direct neural interfaces, mind-machine interfaces or brain-machine interfaces. In his keynote speech at Interact 2011, Antão Almada emphasizes Blake’s ‘interaction style over input modality’ point of view: “People feel naturally what they are supposed to do. Natural means ease of use, non-invasive sensors, to simplify as much as possible, to give intelligence to the interface so that the users get only the useful information.” The company he works for uses NUIs mainly in marketing applications, where people do not have time to learn how to interact with the applications they build and the need for easy, learnable interaction based on skills people already have is particularly strong. Dennis Wixon talks about NUIs and interfaces in general in terms of principals and guidelines (Wixon, 2008). He believes that from a historical analysis of user interfaces we can extract a set of principles and guidelines for each interface type. “The principles are what drives the design. The guidelines are simply derivations of the principles for an individual context. Principles are what’s important. Principles and data drive successful design.” In this sense he analyses three different interface types that primarily build upon text—command line interfaces, graphics—graphical user interfaces and objects—natural user interfaces. He notes that interaction in CLIs builds upon the psychological function of recall as the user is disconnected from the static system he interacts with and has to direct the system by learning/recalling a high number of commands. He continues by describing GUIs as an exploratory and responsive type of interaction, where the user scans through menus and recognizes the commands he had to learn and recall within CLIs. Wixon argues that interaction with GUIs is indirect as the user actually controls the mouse or the keyboard and not the GUI itself. NUIs, on the other hand, provide an unmediated interaction that is evocative and thus relies on user intuition. The commands in a NUI are few and the interaction is fast. Wixon states that NUIs are also contextual and that they understand the environment they are in and react to it naturally. He concludes this analysis of interfaces by extracting a set of principles that should apply to NUI design: the principal of performance aesthetics (the interaction should be enjoyable), the principle of direct manipulation, the principle of scaffolding (the system should support actions as you move forward and should reveal itself in those actions), the principle of contextual environments and the principal or the super real (to take real things and extend them in a logical yet unrealistic way in the digital world). These 5 principles build upon three core principles: social, seamless, spatial. These are explained on an example – the Microsoft Surface multitouch tabletop computer. Surface is social as it encourages social interaction around a shared information space and brings people together instead of isolating them, the actions of a Surface user and the interaction with the Surface are the same, which makes the Surface seamless and spatial as the objects in the interface have an implied physicality and the interaction with the Surface leverages spatial memory. Bill Buxton supports this natural user interface over natural user interface point of view: “It’s not about speech, it’s not about gesture, it’s not even about the phone, and it’s not about human-to-human communication,” he says. “How these things work together in a natural and seamless way that reduces complexity for the users — that’s what we’re about. Getting these things right opens up another dimension in how we have technology integrated into our lives” (Buxton, 2010). His understanding of what natural in natural user interfaces means is: “designing to take advantage of the skills we acquired in a lifetime of living in the real world. These skills are motor-sensor skills, cognitive skills and social skills.” In this sense, a designer of natural user interfaces must take care not to waste people’s skills. This design paradigm also leads to interfaces that are natural to some users and not natural to others. For example, someone that has invested the time and effort to learn touch typing may find editing text in ‘vi’ natural. On the other hand, despite touch being usually regarded as a natural means for interaction, Foehrenbach et al. (2008) surprisingly report how tactile feedback added to gestural interaction with high resolution interactive walls increases error rates by 10 %. Kurfess (2013) shares this hardware-agnostic point of view on NUIs. In his opinion, natural user interfaces are not about input modalities, but about interaction style. A user interface becomes natural with careful interaction design and planning; the word natural here means that interaction is appropriate for the user, the content, and the context in which the interaction takes place. This can be achieved by reusing skills that the user already has and building upon experience and expertise often unrelated to computer use. 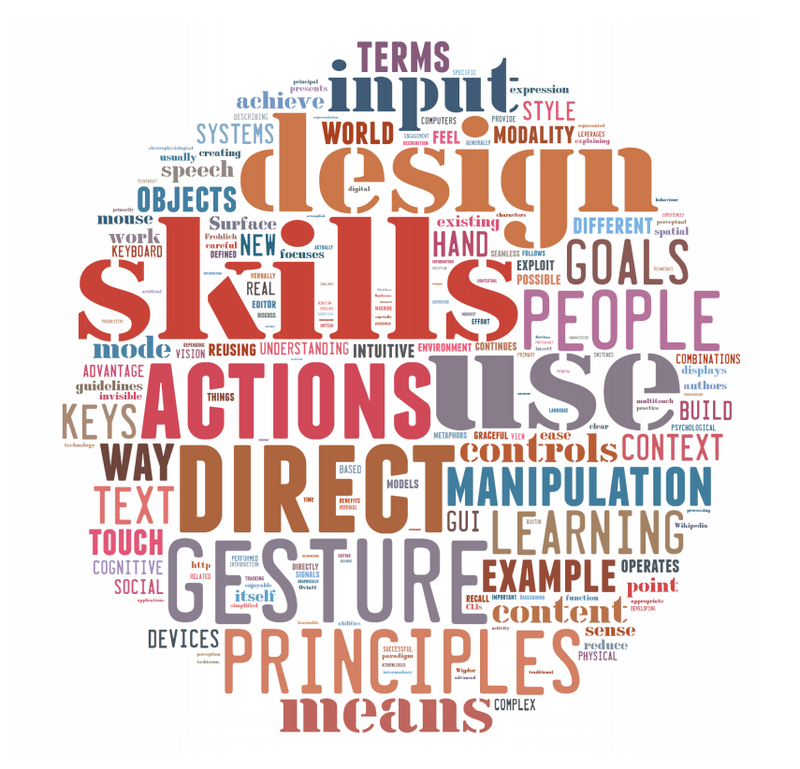 Kurfesses key guidelines for developing natural user interfaces are the use of direct manipulation where possible, enabling instant expertise for the user, reducing cognitive load and inducing progressive learning. If direct and graceful manipulation have been terms used to discuss NUI-like interaction in the past, some authors suggest new terms for future discussion. Among them are Oviatt and Cohen’s Perceptual User Interfaces (PUI) (Oviatt and Cohen, 2000), Wixon’s Organic User Interfaces (OUI) (Wixon, 2008) and Petersen and Stricker’s Continuous Natural User Interfaces (CNUI) (Petersen and Stricker, 2009). These are often restatements or combinations of other established and NUI related research fields we discussed here. For example, perceptual user interfaces are a combination of natural user interfaces and intelligent user interfaces: “PUIs are characterized by interaction techniques that combine an understanding of natural human capabilities (particularly communication, motor, cognitive, and perceptual skills) with computer I/O devices and machine perception and reasoning. They seek to make the user interface more natural and compelling by taking advantage of the ways in which people naturally interact with each other and with the world — both verbally and non-verbally” (Oviatt and Cohen, 2000). The word cloud presented in the figure above concurs with this definition. We created the word cloud with the text of this section, which surveys various definitions of NUIs. After stop words removal1 , the emphasis of each word is proportional to its normalized frequency in the text. We can see that the word, which strikes out the most, is ‘skills’; for an interface to feel natural it must be intuitive and therefore it must rely on skills that the user has already obtained in life. For example, due to their widespread use, the keyboard and mouse may also be considered as natural user interfaces. In this sense we can say, that once the skills to operate an interface are acquired, any interface can be regarded as natural. To some people, the gesture of waving on a sidewalk (to stop a taxi) is an example of a natural user interface, while to some it is not. It depends on the user, but also on the context in which the interaction takes place. Exploiting contextual information to the benefit of human-computer interaction broadens the communication channel between user and computer even further which in turn opens up new possibilities for designing interaction that exploits skills that users already possess. On one hand, natural user interfaces ease the acquisition, understanding and exploitation of context and on the other hand, context makes achieving natural interaction easier. Excerpt from the PhD thesis available here. Our members: Andrej Jerman Blažič and Franc Novak, have published a book chapter in book titled E-Learning – Instructional Design, Organizational Strategy and Management. Serious games are part of the new emerging world of education environment that is based on sophisticated technology with elements of entertainment. They have been seen as good supplements for supporting the learning processes due to their capability to increase visualisations and challenge the student creativity. They have the potential to significantly improve training and education activities and initiatives. As a part of serious computer games, business simulation games support training and learning focused on the management of economic processes. They have been proven to be useful in empowering and mediating learning business content. This chapter addresses the simulation business games used in the educational process by analysing selected popular games regarding their properties that are considered as important in the learning process. The first part presents a short introduction in the field of business games and the approach used in selection of the studied games. The next part provides a review of related articles and brief overview of the state of the art that has guided the selection of business simulation games to be analysed and assessed. The game parameters used in the assessment have been defined and described. The analysis and the assessment report are followed with brief concluding remarks. This post briefly summarizes definitions of research fields closely-related to natural user interfaces and context-awareness. It is an excerpt from the PhD thesis available here.The aim is to highlight their common ground and to show how all strive towards the same goal: a general improvement in Human-Computer Interaction by bringing the E (as environment or context) in the HCI picture. The communication triangle of Human-Computer Interaction; communication is possible on all levels, between each pair of the involved entities: human, computer and environment. Two types of arrows represent two types of communication: explicit and mplicit. Intelligent User Interfaces (IUI): “Intelligent user interfaces (IUIs) are human-machine interfaces that aim to improve the efficiency, effectiveness, and naturalness of humanmachine interaction by representing, reasoning, and acting on models of the user, domain, task, discourse, and media (e.g., graphics, natural language, gesture). As a onsequence, this interdisciplinary area draws upon research in and lies at the intersection of human-computer interaction, ergonomics, cognitive science, and artificial intelligence and its subareas (e.g., vision, speech and language processing, knowledge representation and reasoning, machine learning/knowledge discovery, planning and agent modelling, user and discourse modelling)” (Maybury, 1998). Ubiquitous Computing (UBICOMP): “Ubiquitous computing is the method of enhancing computer use by making many computers available throughout the physical environment, but making them effectively invisible to the user” (Weiser, 1993). Pervasive Computing: “A device can be a portal into an application-data space, not a repository of custom software that a user must manage. An application is a means by which a user performs a task, not software written to exploit a device’s capabilities. And a computing environment is an information-enhanced physical space, not a virtual environment that exists to store and run software” (Saha and Mukherjee, 2003). Physical Computing: “Physical computing, in the broadest sense, means building interactive physical systems by the use of software and hardware that can sense and respond to the analog world” (Wikipedia, 2013a). Ambient Intelligence (AmI): “Ambient Intelligence (AmI) is about sensitive, adaptive electronic environments that respond to the actions of persons and objects and cater for their needs. This approach includes the entire environment – including each single physical object – and associates it with human interaction,” (Aarts and Wichert, 2009) or from a more philosophical point of view: “Ambient Intelligence is the way for us to re-immerse ourselves in life, and not in technology” (Epstein, 1998). Everyware: “In everywhere, all information we now look to our phones or Web browsers to provide becomes accessible from just about anywhere, at any time and this is delivered in a manner appropriate to our location and context” (Greenfield, 2006). Internet of things (IoT): “The basic idea of this concept is the pervasive presence around us of a variety of things or objects – such as Radio-Frequency Identification (RFID) tags, sensors, actuators, mobile phones, etc. – which, through unique addressing schemes, are able to interact with each other and cooperate with their neighbours to reach common goals” (Atzori et al., 2010). Among these research fields UBICOMP is the oldest and perhaps the most influential one. It started considering the environment in HCI and predicted a future where computing devices disappear in the background and users interact with them through the physical environment. The shift from past-HCI to future-UBICOMP-HCI is illustrated in the figure below. Illustration of HCI’s past (a single user explicitly interacts with a single computer; left) and HCI’s future as envisioned by UBICOMP (many seemingly invisible computing devices available to users, right). Another article by the members of our community has been published: “A Slovene Translation of the System Usability Scale: The SUS-SI” in the International Journal f Human-Computer Interaction journal. Abstract: The System Usability Scale (SUS) is a widely adopted and studied questionnaire for usability evaluation. It is technology independent and has been used to evaluate the perceived usability of a broad range of products, including hardware, software, and websites. In this paper we present a Slovene translation of the SUS (the SUS-SI) along with the procedure used in its translation and psychometric evaluation. The results indicated that the SUS-SI has properties similar to the English version. Slovene usability practitioners should be able to use the SUS-SI with confidence when conducting user research. 50 free e-prints available here. I think that I would like to use this system frequently. I found the system unnecessarily complex. I thought the system was easy to use. I think that I would need the support of a technical person to be able to use this system. I found the various functions in this system were well integrated. I thought there was too much inconsistency in this system. I would imagine that most people would learn to use this system very quickly. I found the system very cumbersome/awkward to use. I felt very confident using the system. I needed to learn a lot of things before I could get going with this system. Menim, da bi ta sistem rad pogosto uporabljal. Sistem se mi je zdel po nepotrebnem zapleten. Sistem se mi je zdel enostaven za uporabo. Menim, da bi za uporabo tega sistema potreboval pomoč tehnika. Različne funkcije tega sistema so se mi zdele dobro povezane v smiselno celoto. Sistem se mi je zdel preveč nekonsistenten. Menim, da bi se večina uporabnikov zelo hitro naučila uporabljati ta sistem. Sistem se mi je zdel neroden za uporabo. Pri uporabi sistema sem bil zelo suveren. Preden sem osvojil uporabo tega sistema, sem se moral naučiti veliko stvari. In a survey published not long ago, we found out that usability testing is not so widespread as it should be given its importance. So to jump start your usability evaluations, we’ve prepared Google forms with the questionnaires, both English (SUS) and Slovene (SUS-SI). Feel free to use them, just make sure to make your personal copy before (to keep this links clean). We’d like to thank all who contributed to the translation and validation of the questionnaire with comments and/or filling out the survey. Special thanks goes to James R. Lewis, author of Quantifying the user experience and many influential papers in the areas of usability testing and measurement. He ‘warmly replied to a cold email’ and helped a great deal with the psychometric validation of the translation and co-authored the paper. A truly beautiful academic experience. Blažica, Bojan, and James R. Lewis. “A Slovene Translation of the System Usability Scale: The SUS-SI.” International Journal of Human-Computer Interaction Vol. 31, Iss. 2, 2015. The popularity of interactive surfaces is increasing because of their natural and intuitive usage. Adding 3D multi-point interaction capabilities to an arbitrary surface creates numerous additional possibilities in fields ranging from marketing to medicine. Interactive tables are nowadays present in numerous museums, schools and companies. With the advent of low-cost RGBD cameras, thee-dimensional surfaces are slowly emerging as well, attracting even more attention. This paper presents an affordable system for 3D human-computer interaction using a RGBD camera that is capable of detecting and tracking user’s fingertips in 3D space. The system is evaluated in terms of accuracy, response time, CPU usage, and user experience. The results of the evaluation show that such low-cost systems are already a viable alternative to other multi-touch technologies and also present interesting new ways of interaction with a surface-based interfaces. Today we have successfully completed the HCI-IS 2014 conference. This was the 3rd event organised by the HCI.si community, an international conference on Human Computer Interaction in Information Society. The conference was organised in scope of Information Society Conference organised by Jožef Stefan Institute. There were seven contributions accepted to the conference and a keynote talk. The deadline for paper submission for HCI-IS 2014 has been extended for additional week. A new deadline is 19th of May 2014. We are looking forward for your contributions. On 14th and 15th of February there were open-days at the Faculty of Computer and Information Science. 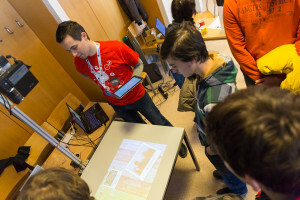 ViCoS Lab has presented an alternative multi-touch table that uses Kinect sensor to detect fingers and a projector to display the interface on a regular table. In a recent UX magazine article context-awareness was listed as one of the top UX trends in 2013. Yes, the same context-awareness known from HCI literature since the early 90s (the term was first used by Schilit et al. in 1994 to be precise). So it took nearly 20 years for context-awareness to find its way from labs to real life – another confirmation of what Bill Buxton calls the long nose of innovation. Other examples are the mouse and multitouch displays, which took approximately 30 and 20 years to reach mainstream respectively. Stay informed and share your thoughts on our mailing list! Subscribe here!